For me, iOS games can be broken into two categories: games for deep-diving into, and games for playing for 20 minutes here and there. Air Attack 2, by Art In Games, falls into the latter category, and that’s not a knock on it by any means. It’s a beautifully rendered game with fluid gameplay that’s perfect for jumping in and out of quickly. 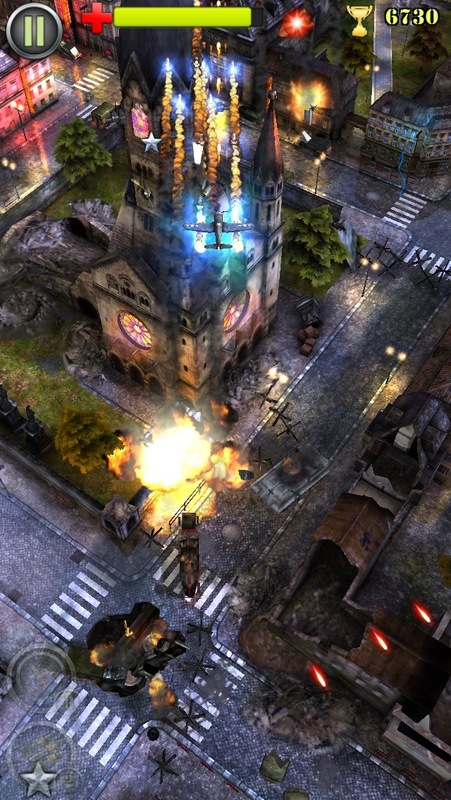 Enjoy the classic atmosphere of WW2 arcade shoot-em-ups in modern rendering. 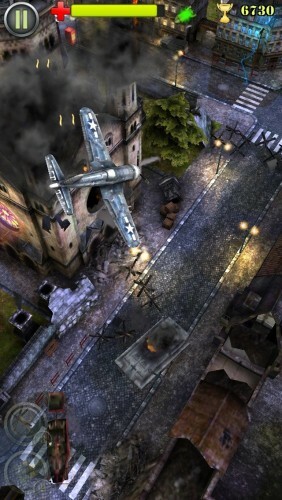 Air Attack 2 has many different missions, and in those missions there are different objectives to achieve. It’s no different than a lot of games that require hitting objectives to move on and level up: some of the objectives are pretty simple, and others are harder to achieve. On one mission with three objectives, for example, one of them is to destroy 50% of enemies with the tail gunner, which I found difficult to do. Tail gunner mode is pretty fun – it’s actually my favorite. Several of the missions allow you to purchase tail gunner credits. You can have a maximum of five tail gunner credits per mission, and each time you switch to tail gunner during a mission, one of them gets used. It’s pretty clever, and it’s fun, but it also means that you’re spending 250 coins for each use of the tail gunner. Also, when using tail gunner in a mission like this where it’s an optional mode, it only lasts for so long before it pops you back out into top down view, which leads to my difficulty in shooting down 50% of the enemies I kill with the tail gunner. There are a lot of enemies in the game, and I haven’t figured out the balance to achieve the tail gunner objective. The game has several different ways to increase your capabilities, including upgraded (or new) weapons, better airplanes, and adding wingmen and the aforementioned tail gunners. One of the more satisfying options is buying rockets (you’re allowed to purchase a maximum of five rocket uses per mission). When you activate your rockets, you fill the sky with a wall of steel that just cuts through everything in your path. It’s glorious. One thing I should make clear about the coins and the bars of silver used to buy upgrades and refill various weapons and options: these are not in-app purchases. Both gold coins and bars of silver are earned in the game. It’s a surprising and refreshing approach to the in-game consumables model in an iOS game. Art In Games deserves huge kudos for bucking the trend and making this game a one time purchase even with coins and silver required in the game to make certain purchases, especially considering the low price of Air Attack 2. I did find it confusing initially that I had to go into an achievements view to actually claim coins that I’d earned by completing mission objectives. At first I didn’t realize I had to manually retrieve the coins and kept playing subsequent games without claiming them. I don’t normally play a lot of shoot ‘em up games (although I was hooked on the original Contract Killer by Glu Games, until they ruined it by making leveling up impossible without numerous IAPs). As a result, I was a little surprised that I immediately started enjoying Air Attack 2. At first look, my grumpy old man mode kicked in, and I thought I’d be reviewing a game that I didn’t enjoy and didn’t want to recommend. Instead, I found myself impressed with the game and having fun playing it, as you can see in the embedded YouTube video at the end of this review. Air Attack 2 has several things going for it that help make it more fun than it sounds. It won me over with nice graphics, a great thematic soundtrack, smooth, responsive gameplay, good variety, and the sheer fun of shooting enemy planes, cars, tanks, and buildings. My only real complaint with this game is that each mission is on rails, so to speak. Whenever you play a particular mission, it’s always going to end in tail-gunning the tower. However, you can always improve your score and achieve objectives missed previously, and if you don’t play well you’ll never get that far anyway, so gameplay isn’t exactly the same each time. The real richness is in unlocking new missions and earning and buying upgrades. I’m not really a big fan of war and I think violence is generally stupid, but shooting things in video games can be a lot of fun. No one has to die or get hurt except a few deserving pixels. Air Attack 2 meets the shoot-em-up need quite nicely, and in great style. I am keeping this game on my iPhone. One final note: On the Art In Games website, the name of this game is shown as both AirAttack 2 and Air Attack 2. 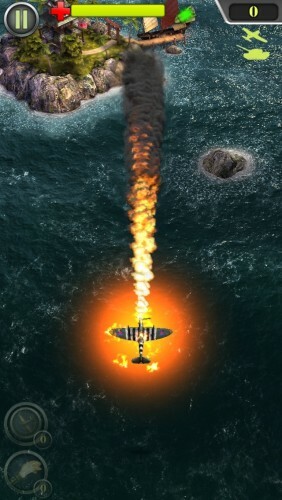 In the iOS store, the name is shown as AirAttack 2, while inside the game, it’s written as Air Attack 2. I’m not sure of the reason for the inconsistent branding. 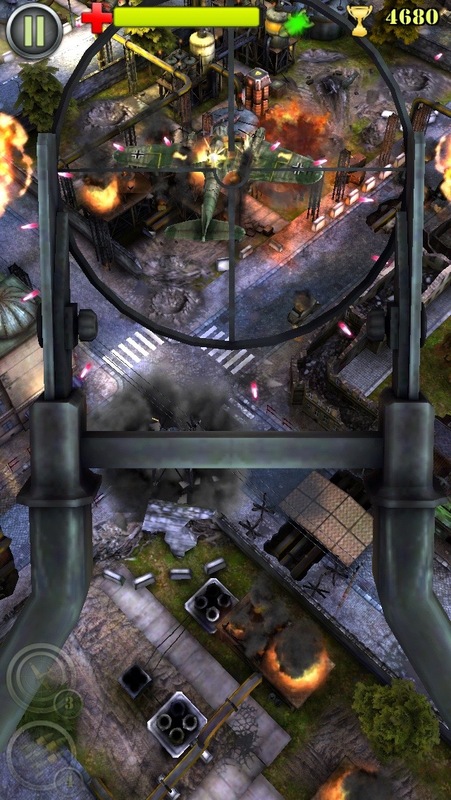 Air Attack 2 is a universal iOS app, requires iOS 8 or later, and is currently $0.99 in the iOS App Store.